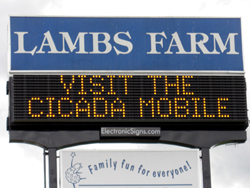 When ElectronicSigns.com was selected to handle the upgrade of an incandescent message center for Lambs Farm in Libertyville, Illinois we were thrilled for several reasons. As a non-profit agency, Lambs Farm was on a tight budget and the electrical costs for their existing incandescent message center were constantly rising. We were able to replace the old incandescent sign with the bright, energy-efficient Amber LEDs of a Roadstar 89mm display. The Roadstar is specifically designed for long distance and higher elevation viewing. Not only has Lambs Farm seen a significant decrease in their monthly electric bills, the new sign has also given them improved reliability and visibility. With an LED sign project portfolio as vast and diverse as ours, you're certain to find something to inspire your own LED sign project. Call one of our LED sign experts at 800-341-6297 to find out how ElectronicSigns.com can help you choose the right product for your project. Full Color Video displays can display everything from graphics, animations, text, text overlay to full and real-time video. The video option can take a signal from DVD, VHS, cable TV, or even directly from a video camera. The 17mm series is perfect for advertising along any local city street. High display resolution makes it ideal for slower city traffic volumes. Brilliant red or amber LEDs with 256-shades/grayscaling really attract attention. The 35mm series is ideal for advertising to both faster and slower traffic volumes. With 1 ft. to 4 ft. characters in red or amber LEDs with 256-shades/grayscaling, this LED sign will bring more drive-by customers into your location. The RoadStar series is designed for maximum visibility along highways, highly elevated installations, or any application requiring long distance visibility. Its unique, modular, state-of-the-art design produces a dynamic LED sign that is highly energy efficient, easy to operate, install and service. Ticker updates will attract and hold your customers' attention, whether they?re passing by, waiting in line, or sitting down to discuss your products and services.